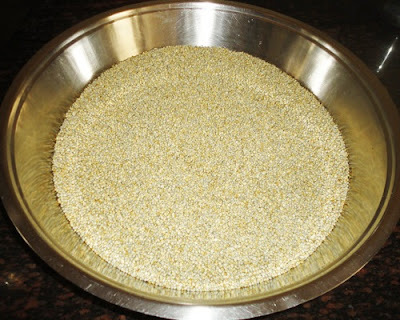 Multigrain flour for thalipeeth - Pearl millet is called as bajri in Marathi, bajra in Hindi, sajje in Kannada. This flour is prepared with roasted pearl millet, green gram, black gram, brown chickpeas, coriander seeds, cumin seeds and fenugreek seeds. 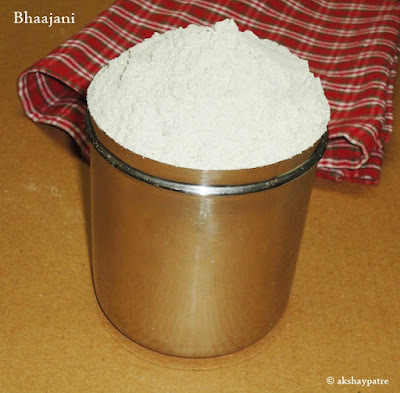 This flour is used to make thalipeeth. Thalipeeth is a popular pancake in Maharashtra. The method of preparation and the ingredients varies marginally. Thalipeeth is usually served with chutney and yogurt for breakfast, lunch and dinner. 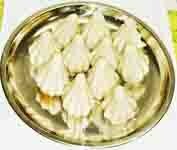 Being a wholesome dry dish thalipeeth is very convenient to carry while travelling. 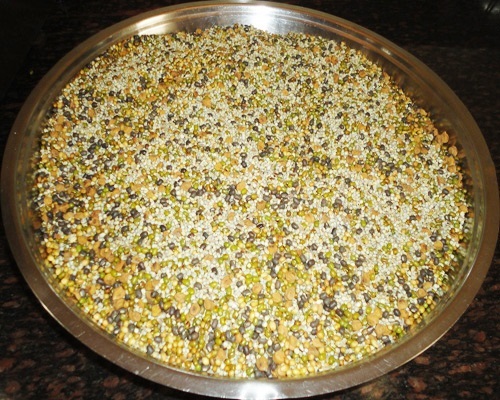 This bajri bhajani is similar to the rice bhajani which I had posted earlier. Only the difference in this recipe is that I have used bajri instead of rice. 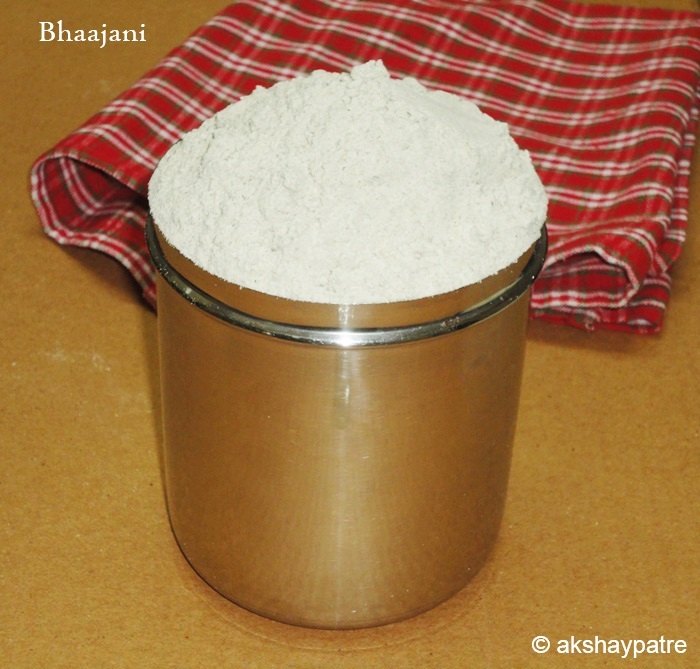 The purpose of using bajri is that it is low in calories and contains less carbohydrate when compared to the rice bhajani. 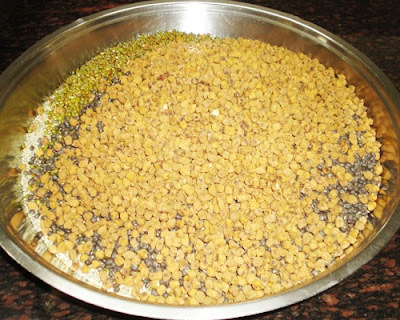 The thalipeeth prepared with this bhajani consisting of pulses like chickpeas, green gram and black gram is very healthy, nutritious and flavourful. 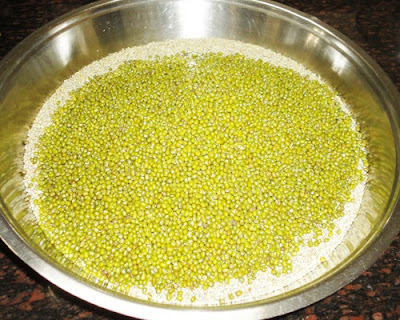 Hand pick the pearl millet, green gram, black gram, chickpeas, coriander seeds and jeera separately. Set aside. 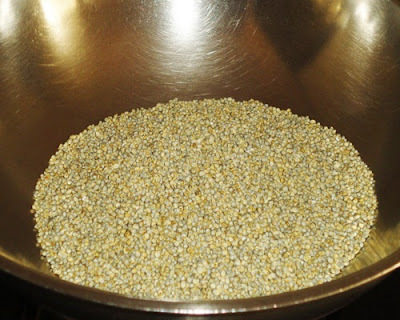 Heat a kadai and roast the pearl millet till they become warm. Transfer to a large plate and set aside. 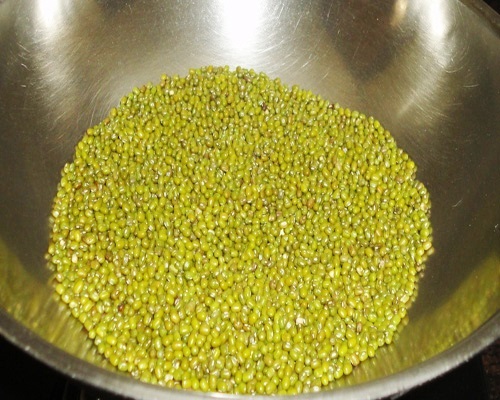 In the same kadai, roast the green gram till they become aromatic. Transfer to the plate. Roast the black gram till they release fragrance and become crisp. Transfer to the plate. Roast the brown chickpeas until crisp. Transfer the roasted chickpeas into the plate. 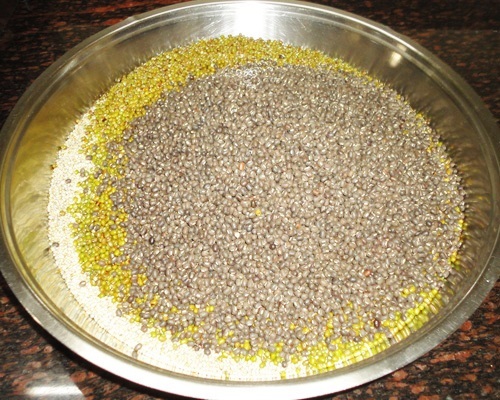 Roast the coriander seeds till they release nice fragrance. Transfer to the plate. Roast the jeera till they become warm. Do not over roast. Transfer to the plate. Roast the methi seeds till they release nice fragrance. Transfer to the plate. Now mix all the roasted ingredients and allow them cool. Then make the multi grain flour for thalipeeth from the above ingredients from flour mill or atta chakki. 1. Hand pick the pearl millet, green gram, black gram, chickpeas, coriander seeds and jeera separately. Set aside. 2. 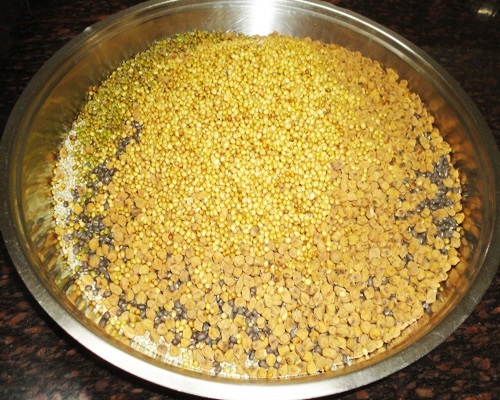 Heat a kadai and roast the pearl millet till they become warm. Transfer to a large plate and set aside. 3. In the same kadai, roast the green gram till they become aromatic. 4. Transfer to the plate. 5. Roast the black gram till they release fragrance and become crisp. Transfer to the plate. 6. Roast the brown chickpeas until crisp. Transfer the roasted chickpeas to the plate. 7. 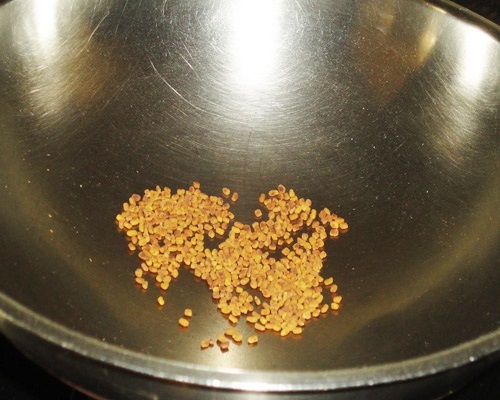 Roast the coriander seeds till they release nice fragrance. Transfer to the plate. 8. Roast the jeera till they become warm. Do not over roast. Transfer to the plate. 9. 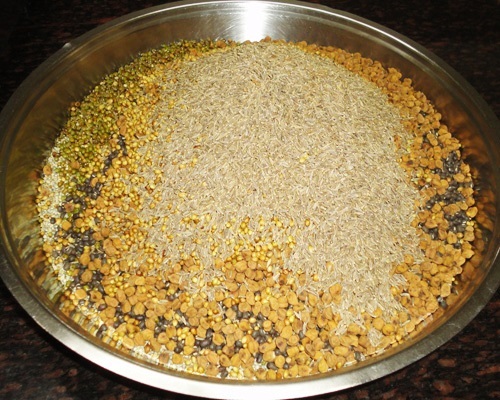 Roast the fenugreek seeds/methi till they release nice fragrance. Transfer to the plate. 10. Now mix all the roasted ingredients and allow them cool. 11. Then make the multi grain flour for thalipeeth from the above ingredients from flour mill or atta chakki.